Ordered them all this evening, from five different seed companies. My first order was confirmed with an email at 9:44 pm EST. I'd guess I started ordering at 9:15 pm or so. The last order was confirmed at 11:15 pm. Other order confirmation times in between were 10:17 pm, 10:35 pm, and 10:58 pm. As you can see, the amount of time I spent on each website did vary a little bit, depending on what I was there for. I pulled up the first seed company's website and just started ordering seeds, going through a mental list of what I needed/wanted, and writing down the varieties as I added them to my online cart. This is what I call the base order. Then I moved on to the second seed company and started filling in with varieties that the first seed company didn't have, then on to the third company and the fourth company. One other task to do before I feel like I've got my seeds under control for the 2011 season is to list all my seeds in a spreadsheet that I can print and carry around with me. Then when I see seeds I want to buy, I can check to make sure I'm not buying any duplicates. Oh wait! I have an iPhone. I should store my seed list on my iPhone. That would really solidify my reputation as a seedy gardening geek! There are two questions people ask me about buying seeds. Where do I buy my seeds? From several different sources, for different reasons. Nature's Crossroads, Pinetree Garden Seeds, Baker Creek Heirloom Seeds, Botanical Interests and for the first time, Summerhill. How do I know what to order? I've been gardening for decades (there, I said it - decades) so I have some tried and true varieties I always order, and then I just read through the descriptions and order what sounds good without being over hyped. I'm a sucker for any seed with a story that goes with it. And I'm pretty quick about deciding to hit the "add to cart" button because a packet of seeds is a small investment with the potential for a big payoff. I worry about the time and space problems later. If you are a new gardener, don't despair, if you keep at it, someday you'll be ordering seeds this way, too. By the way, if you haven't ordered seeds yet, or you've spent all your seed money and still want more seeds, you can enter a giveaway to seed your seed stash with six packets of seeds from Nature's Crossroads. Hurry, giveaway ends at 9:00 pm EST, Thursday, Feb. 17th. Me, I am ready. I have the seeds, now I wait for a good weather. Isn't it fun?! I love sitting there with my computer in my lap, going back and forth to see who has what. I bought some basic old standbys here locally, and then placed a big order. I tried two seed companies who either had IT problems or were out of what I wanted, so I ordered all from 1 company. And when they came - packets had no photos. I don't HAVE to have them, but it would be SO much easier for a quick glance & planning. 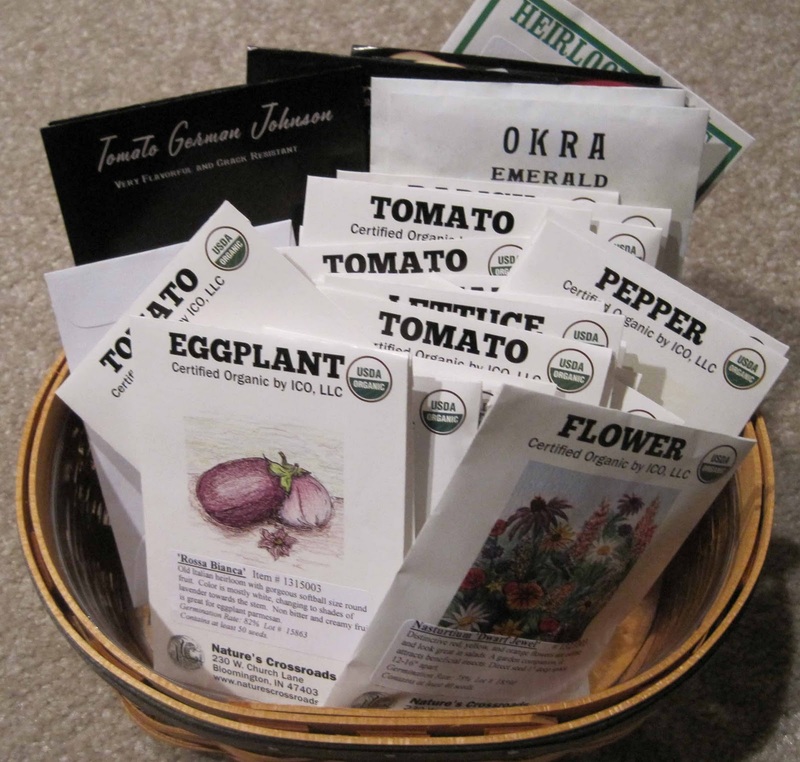 My seeds are ordered and in hand from Johnny's Selected Seeds, Renee's Garden, High Mowing and Botanical Interests. I suspect that even though I have some seeds left from last year that I will inevitably buy a packet or two when I am down at Avery's General Store. This was my first year ordering seeds! I got in several seed catalogs and read them all, several times. I made a list of things I wanted (simple things to start) from all the catalogs and found one place to but them all, Southern Exposure Seed Exchange. I am trying to make a good chart of when and where to plant, their needs, and so on. I'm a little nervous that I've bitten off more than I can chew as this is only my second try at gardening. Two years ago I had a small garden, but I was just too busy in the other parts of the yard.... we had only moved in 8 months earlier! Then I took off last year. I've got plenty of reading in and a grandmother who had a large urban garden for decades :) I think I may be OK!! I was shocked to see how much the cost of seeds has gone up! Good luck with your columbine, I can never get mine to germinate.... I will be interested to see how yours does! It's great to know that I'm not the only one staring at my seed envelopes waiting for the days when I can sprinkle those little drops of life into the seed starters. Ahhh...this time I've ordered from Select Seeds, Renee's Garden, and Botanical Interests. I just have to find something to do until the Chicago Flower Show on March 5. Seed envy! For the most part, I can usually plant anytime I want to. I've been wanting to order seeds but am concerned about requirement for bringing them in from overseas.